SSC has released important instruction for during delhi police constable exam 2016-17, Candidates are strictly advised to desist from bringing bags, phone etc. 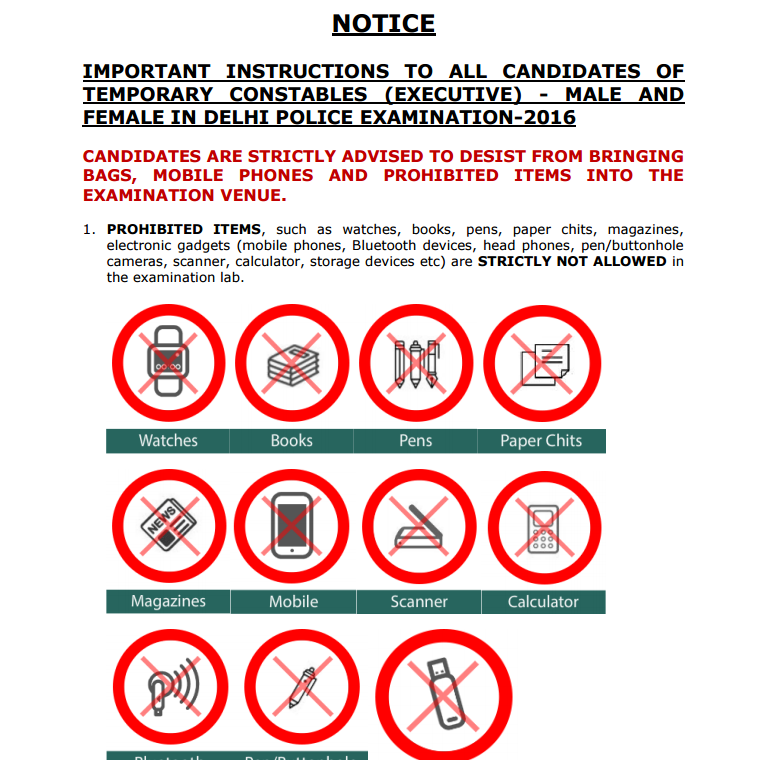 NOTICE IMPORTANT INSTRUCTIONS TO ALL CANDIDATES OF TEMPORARY CONSTABLES (EXECUTIVE) - MALE AND FEMALE IN DELHI POLICE EXAMINATION-2016 CANDIDATES ARE STRICTLY ADVISED TO DESIST FROM BRINGING BAGS, MOBILE PHONES AND PROHIBITED ITEMS INTO THE EXAMINATION VENUE. 1. 2. Pen/pencil and paper for rough work would be provided in the examination lab. Electronic watch (timer) will be available on the computer screen allotted to the candidates. 3. It is reiterated that Candidates should not bring Bags and prohibited items as mentioned above to the examination venue. In case they bring any such item, they would have to make their own arrangements for safe custody of such items. The Commission shall not make any arrangement nor be responsible for the safe custody of any such item. 4. If any such item is found in the possession of a candidate in the examination lab, his/her candidature liable to be cancelled and legal/criminal proceedings could be initiated against him/her. He/she would also liable to be debarred from appearing in future examinations of the Commission for a period of 3 years. 5. Candidates should not wear charms, veil, items containing metals such as ring, bracelet, earrings, nose-pin, chains, necklace, pendants, badge, brooch, hair pin, hair band, clothes with full sleeves or big buttons, etc. Candidates are advised to wear open footwear like chappal, flotter, instead of shoes as the candidates would be asked to remove shoes by the frisking staff. 6. Candidates are cautioned that they should appear only once for the recruitment of Temporary Constables (Executive) - Male and Female In Delhi Police Examination-2016. Any candidate, who appears more than once for the examination, would not only be disqualified from the said examination but would also be debarred for three years from all examinations conducted by the Commission. 7. 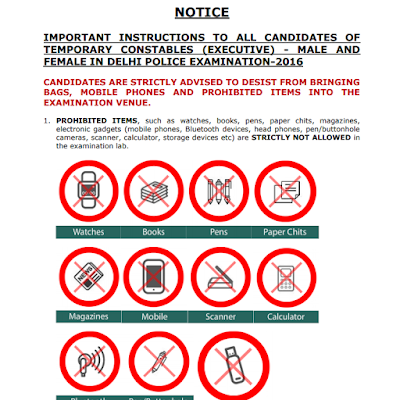 Candidates must also refrain from creating any obstruction during the conduct of the Temporary Constables (Executive) - Male and Female In Delhi Police Examination-2016. If any candidate is found obstructing the conduct of the examination or creating disturbances at the examination venue, his/her candidature shall be summarily cancelled. Such candidate shall also be liable to be debarred from future examinations of the Commission and legal/criminal proceedings could be initiated against him/her. 8. It may also be noted that no re-examination would be conducted if it is found that the examination was disrupted on account of instigation by the candidates. Click Here to Download Notice regarding Important Instructions.